Last month we looked at how unquestioned values of growth, inequity, debt and inholistic economics have swelled our costs of living to a bursting point. The good news was that changing such values can give huge economic benefits. This month, let's bring those inefficient systems closer to home. Our homes. And see that concrete opportunities to act and really impact major problems are close at hand. Both global warming and peak oil tell us it's time to take real action to dramatically improve energy efficiency and reduce consumption of fossil fuels. What to do? Every list starts with "replace your lightbulbs with compact fluorescents . . ." OK. That is something we can do, and they tell us it reduces energy use by 75%. But we only get half of that savings during the heating season if we have electric heat, as the waste heat from the inefficient incandescent bulbs were heating our home. And we need to take action on community, state, national and global levels as well. It's rarely suggested we rattle the cages and demand actions on other levels. Well, here's one action we can address on several levels, that felt really good when I heard it. Zero-energy homes. Let's not build any more homes that consume energy, that use fossil fuels, that take more electricity off the wires than they put back. Period. This is a real concrete target, not a wimpy "let's make our homes a little more energy efficient." Buildings use 25% of our energy. Let's draw the line right here and now! Is that possible? It's not only possible but affordable. Remember � we pay our energy bills out of the same pocket as our mortgage payments. And putting our dollars up front into zero-energy homes means real security against rising energy costs. Real security when the power goes out and other people have no heat. And real security in not pushing us into more global wars to grab other people's energy. It makes enough sense that the Lopez Island Community Land Trust in Washington State, which builds homes for the island's hard-working low-income families, has pledged to build all its future homes as zero-energy. Homes on very tight budgets. Habitat for Humanity has built zero-energy homes in Denver , Tennessee, and elsewhere. Super-insulation homes don't have to be high-tech. Architect Kelly Lerner has built whole communities of straw-bale homes in Siberia and China which dramatically improve both comfort and energy efficiency. And they don't have to be ugly. Athena and Bill Steen's projects show these homes can warm the heart as well as the body. There are alternatives to just a lot of insulation. 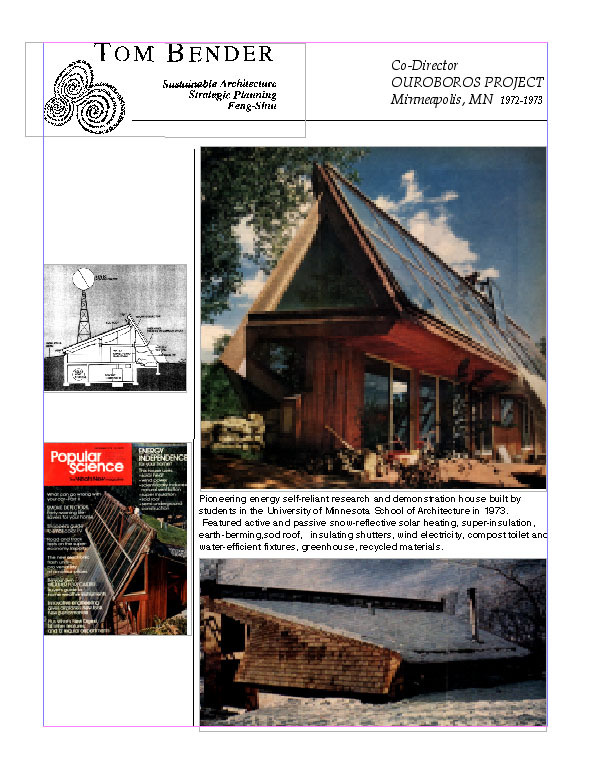 The Ouroboros House we pioneered in Minnesota in 1973 started by berming the north walls, to get the house down into the ground where the temperature is constant. Your starting point is warmer in the winter and cooler in the summer. Traditional desert housing in the southwest uses thick adobe walls. Because of the big daily temperature swings, the daytime heat slowly moves through the walls, keeping the inside warm at night. 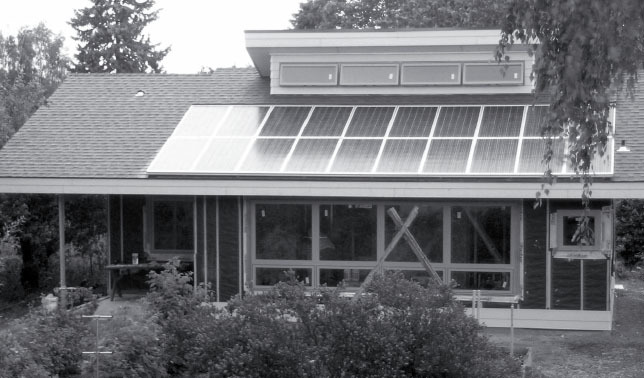 Passive solar heating, with big south windows, lessens the need for insulation or heating systems, as in the Rose House in Portland, OR. The third step is good daylighting and efficient lighting and appliances. And turning them really off, using a power strip, not just "dark screen". Even small changes here can give surprising results. When we built our home 30 years ago, we wanted a peaceful home, not dominated by the sounds of machines - furnaces, dishwashers, garbage disposals, refrigerators, toilets, TVs intruding and dominating our spaces. Passive solar and a wood stove got rid of the furnace. My hands and a dishpan got rid of the dishwasher. A passive "cool box" got rid of the refrigerator, and the TV never came in the door. What incredible peace! Dishwashing is a meditation, and gets me out of cooking. A compost pile feeds our garden. No TV is a blessing, and hours of freedom added to our day. And our whole kitchen cost less than $100! Zero-energy homes heat water with a solar water heater, or in cloudy country with super-efficient heat-pump water heaters soon to be imported. The final step is roof-top solar-electric panels - either now or orienting the roof to install them as prices drop. These export excess electricity to the grid when not needed. Together, these actions can totally, or almost totally, eliminate the need for fossil fuel energy for a home - in almost any climate. And we can go further. The Farallones Integral Urban House project back in 1976 took an existing urban house, and demonstrated how it could become virtually self-sustaining in terms of food as well - on a standard urban lot. Requiring zero-energy houses in our building codes can happen at local, state, or national levels. It helps homeowners. It helps the building industry, transferring investment from oil to building. It helps the future. Oregon pioneered energy efficiency in building codes in the 1970s, with huge benefits. Lets do it again. And with more than houses? Then we can focus on improving what we've already got.